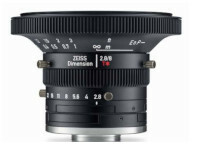 This Zeiss Dimension 8 mm lens is compatible with C-mount cameras having up to 4/3" format (21.6 mm diagonal) sensors. It is a great choice for installations that require excellent image quality for superior results. Zeiss Dimension lenses are ideal matches for today’s CMOS sensors. This lens delivers crisp, high-contrast images even when paired with an image senor having pixels as small as 2 microns. This lens features the Zeiss T* coating to provide high-contrast images free of reflections. The coating also enables high, uniform transmission across both the visible and near infrared spectrum. The smallest deviations in the flange focal distance can degrade image quality. Zeiss Dimension lenses have an innovative adjustment mechanism, enabling the back focus distance to be easily corrected by +/- 0.2 millimeters. In typical industrial installations, the haphazard orientation of a lens’s aperture and focus scales may make them difficult to read. That’s why the azimuth alignment of the scales can be adjusted on Ziess Dimension lenses. Just loosen three screws, orient the scales for maximum visibility, then re-tighten the screws. Zeiss Dimension lenses handle extreme conditions. Three thumb screws for focus lock, and another three for aperture lock, assure stable operation. Tested to DIN ISO 9022, DIN EN 60068-1: 1988-06, DIN EN 60068-2 Part 64: 2009-04, and MIL-Std 810G. The manufacturer's limited warranty covers lenses against defects for two (2) years from the date of factory order. Warranty will not apply if repair or replacement is required because of accident, neglect, misuse, or damage during shipment. See manufacturer's warranty for complete information. Lenses in new condition, in unmodified original packaging, may be returned within 30 days of purchase. A 20% restocking charge will apply, except in cases of defective products and/or shipping errors.